When Bruce Springsteen finally broke through to national recognition in the fall of 1975 after a decade of trying, critics hailed him as the savior of rock & roll, the single artist who brought together all the exuberance of ’50s rock and the thoughtfulness of ’60s rock, molded into a ’70s style. He rocked as hard as Jerry Lee Lewis, his lyrics were as complicated as Bob Dylan‘s, and his concerts were near-religious celebrations of all that was best in music. One critic became so enamored that he quit reviewing to become Springsteen’s manager. But the hosannas, when piped through the publicity machine of a major record company, were perceived as hype by a significant part of the public as well as the mainstream media — Springsteen landed on the covers of Time and Newsweek, but both magazines were covering the phenomenon, not the music. Springsteen’s album, Born to Run, became a hit, and he jumped to arena status as a live act, but as many people were turned off by the press campaign as turned on by the records and shows. 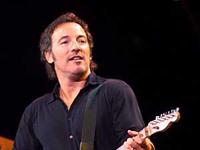 Two decades later, however, Springsteen remained an established star who could look back on a career that had produced one of the best-selling albums of all time, sold-out stadium shows, Grammy awards and an Oscar, and a group of imitators who constituted their own subgenre of popular music. If he no longer seemed divine, he remained popular enough for his Greatest Hits album to enter the charts at number one, and he had won over many of those skeptics from 1975. Growing up in southern New Jersey, Springsteen turned to rock & roll as a teenager and played in a series of bands from the mid-’60s on, varying in style from garage rock to power trio blues-rock. By the early ’70s, he was trying his hand at being a folky singer/songwriter in Greenwich Village. But when he was signed to Columbia Records in 1972, he brought into the studio many of the New Jersey-based musicians with whom he’d played over the years. 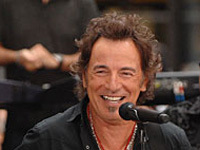 The following year, Springsteen revised his backup group — dubbed the E Street Band — settling on a lineup that included saxophone player Clarence Clemons, second guitarist “Miami” Steve Van Zandt, organist Danny Federici, pianist Roy Bittan, bassist Garry Tallent, and drummer Max Weinberg. With this unit he barnstormed the country while working on his third and last chance with Columbia. By the time Born to Run (August 1975) was released, the critics and a significant cult audience were with him, and the title song became a Top 40 hit while the album reached the Top Ten. What Springsteen needed to do in the wake of the hype, of course, was to play and record more to consolidate his position. He was prevented at least from the latter by a former manager, who kept him in court during the next couple of years. Meanwhile, the musical world changed. Part of the reason critics had welcomed Springsteen so enthusiastically in 1975 was that he seemed a return to basic rock & roll values in a world of soft rock, heavy metal, and art rock. By the time Springsteen returned with his fourth album, Darkness on the Edge of Town (June 1978), however, the punk/new wave movement had outflanked him, pushing him from the vanguard to the mainstream. Similar sounding heartland rockers such as Bob Seger had appeared, so that Springsteen sounded less like an innovator than a member of an established genre. But then came Born in the U.S.A. (June 1984) and a two-year international tour. The album threw off seven hit singles and sold over ten million copies, putting Springsteen in the pop heavens with Michael Jackson and Prince. After touring for more than a year, he released a five-LP/three-CD concert album, Live/1975-85 (November 1986), which topped the charts. After another marathon tour, Springsteen gave the E Street Band notice in November 1989, breaking up a celebrated unit who had stayed together 15 years. In March 1992, he simultaneously released Human Touch and Lucky Town, and though the albums premiered near the top of the charts, they were less successful with fans than previous efforts. In the fall, Springsteen taped an MTV Unplugged segment (though he plugged in after one song), and the performance was released as an album in Europe in 1993. 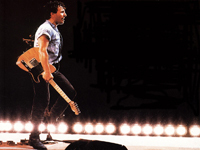 Springsteen continued to tour until July 1993. In the fall, he wrote and recorded “Streets of Philadelphia” for the soundtrack to the film Philadelphia, which concerned a lawyer dying of AIDS. The song became a Top Ten hit in 1994, winning the Academy Award for Best Song and cleaning up at the Grammys the following year. At the same time, Springsteen had readied his Greatest Hits album (February 1995), reassembling the E Street Band to record a few new tracks. The album was an immediate best-seller. Springsteen followed it with The Ghost of Tom Joad (November 1995), another low-key, downcast, near-acoustic effort and embarked upon a brief solo tour. 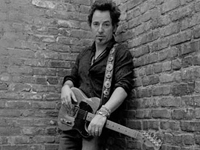 In 1999, shortly after his induction into the Rock & Roll Hall of Fame, Springsteen reunited with the E Street Band (including both Lofgren and Van Zandt on guitars) and embarked on a world tour that lasted until mid-2000, its final dates resulting in the album Live in New York City.